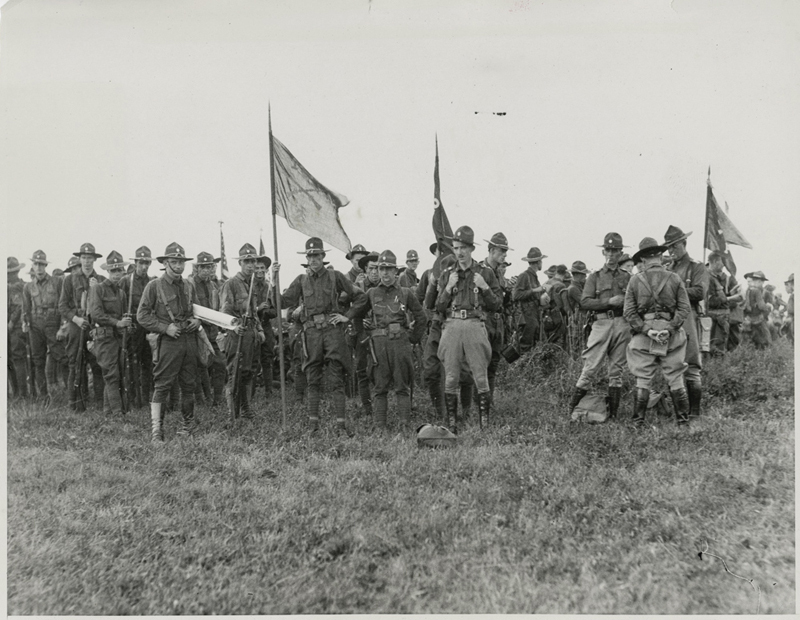 “BROWNSVILLE, PA . . . Pennsylvania National Guard troops sent to prevent violence in the coal regions establish their camp three miles west of Brownsville.” July 31, 1933. 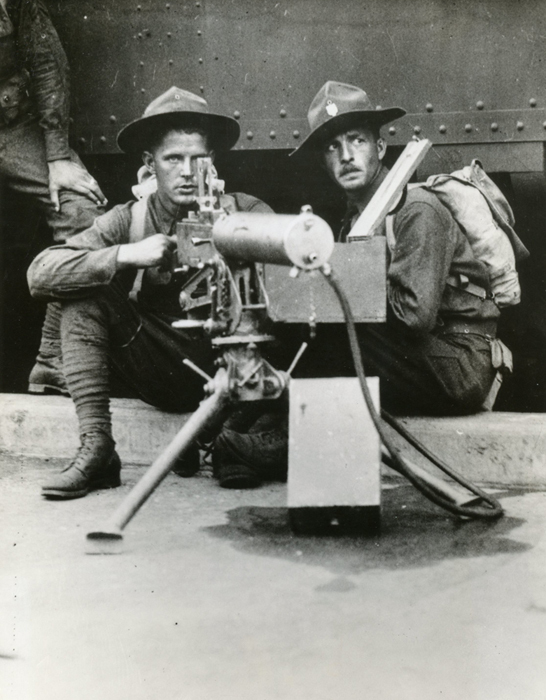 “BROWNSVILLE, PA . . . MACHINE GUNNERS PRESERVE ORDER IN COAL STRIKE AREA. This 112th Infantry National Guard machine gun unit points the business end of a machine at the cameraman as it establishes itself in the bituminous strike area at Brownsville, PA. The militia has taken command of the situation under orders from Gov. Pinchot of Pennsylvania after 10 miners had been injured in the strike disorders.” July 30, 1933. The message resonated with Fayette County’s miners. On July 25, 1933, the Uniontown newspapers reported that 4,000 local miners had walked off work — with many more to follow suit. Picketers blocked roads and entrances to the mines. Fights broke out not only between the miners and company guards, but between the miners and those who were trying to cross their picket line. That might have been a fellow miner who tried to go to work (called a “scab” by the picketers) or just a child trying to deliver his father’s lunch. After the man was given a short talk he was turned loose. The militia ignored an elderly woman who stood nearby with rocks in both hands. 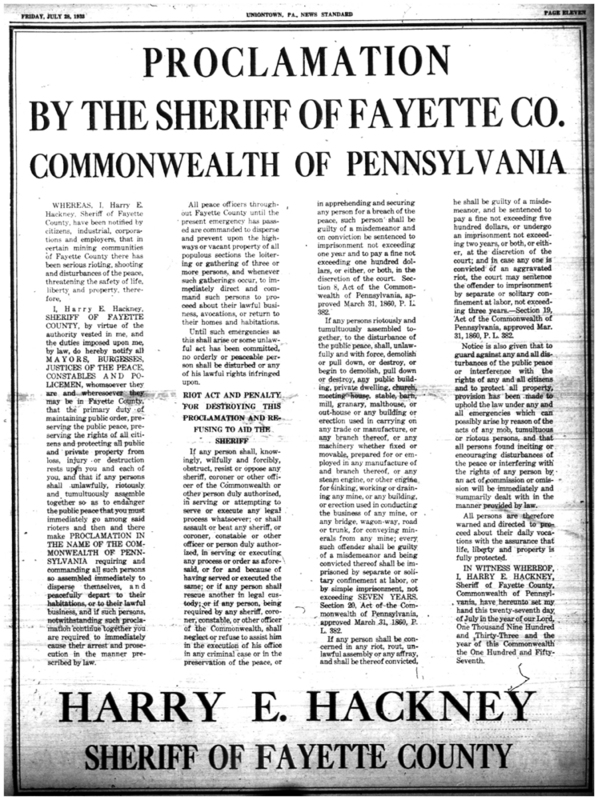 I am informed by the press this evening that you have charged the H.C. Frick Company with conspiring with the Sheriff of Fayette County in importing gunmen to act as deputy sheriff’s in the county. Please be informed that your statement in wholly without foundation. Officials eventually closed the mines for the safety of those trying to cross the picket lines. At least one picketer was shot to death by company guards before the U.S. government intervened and ended the southwestern Pennsylvania strikes on August 8, 1933. Many thanks to the Museum of South Texas History for thinking of us. Please take a minute to stop by their website and/or Facebook page!